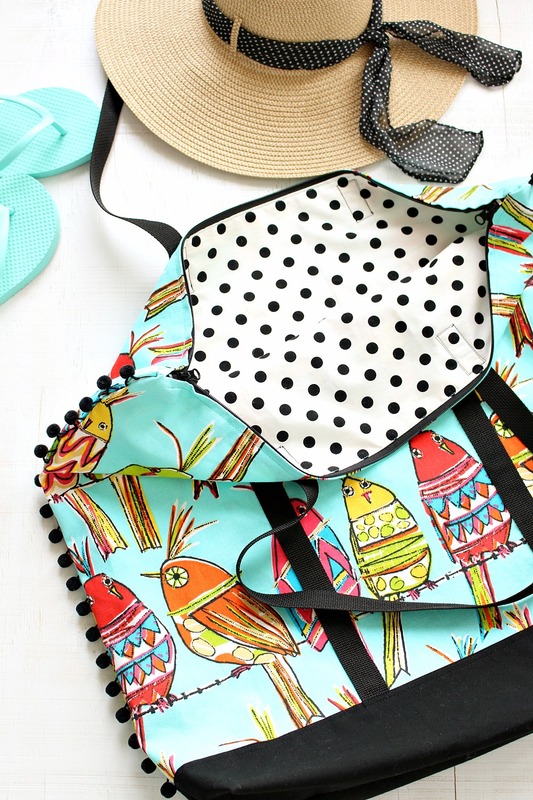 I am so excited to share today’s sewing project: an oversized DIY beach tote with zipper closure and pom pom trim. I’m counting the sleeps until Hubby and I are lying on a beach in Punta Cana with friends. I’m excited for the trip, but I’ve also enjoyed the process of getting ready. Shopping for swimsuits was surprisingly fun and then last weekend my Mom came over and we whipped up this GINORMOUS beach tote for the trip. It’s been way too long since we got together to sip tea and make something. The funny thing is that while we were in Fabricland, trying to pick out the perfect turquoise print, we ran into my Mummu there! I love my crafty family. 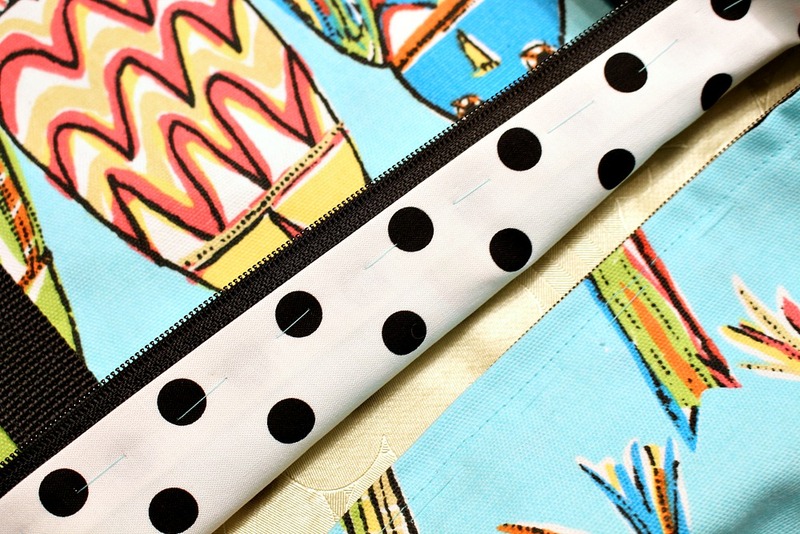 If the pretty turquoise print and pom pom trim don’t make me smile, the surprise polka dot lining definitely will. 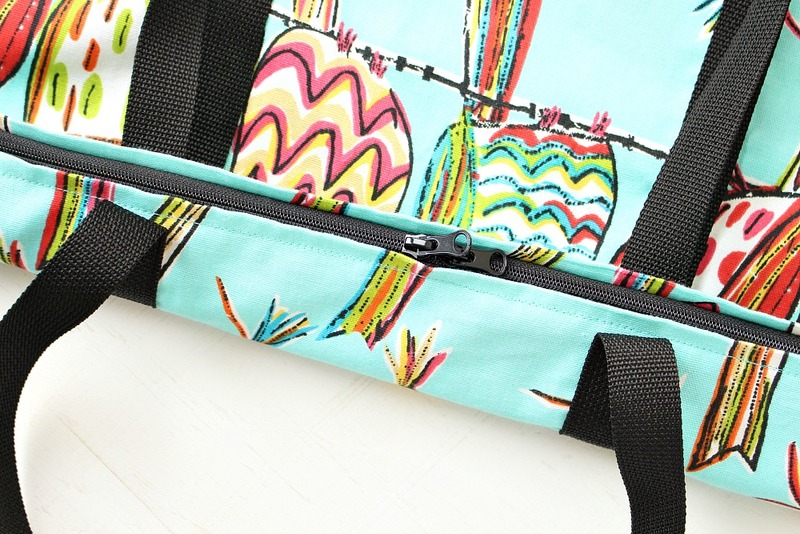 Plus this DIY beach tote with zipper top will keep our stuff a little more secure. We can’t risk losing our sunblock because Hubby is so fair, he burns like a lobster just puttering around the yard! 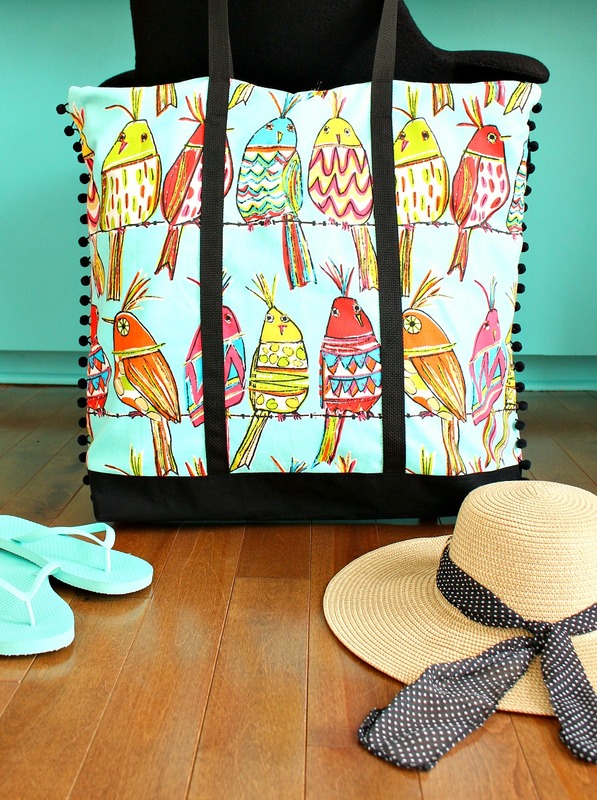 Here’s how we made this beach bag – in case your feet will reach a beach sometime this year! 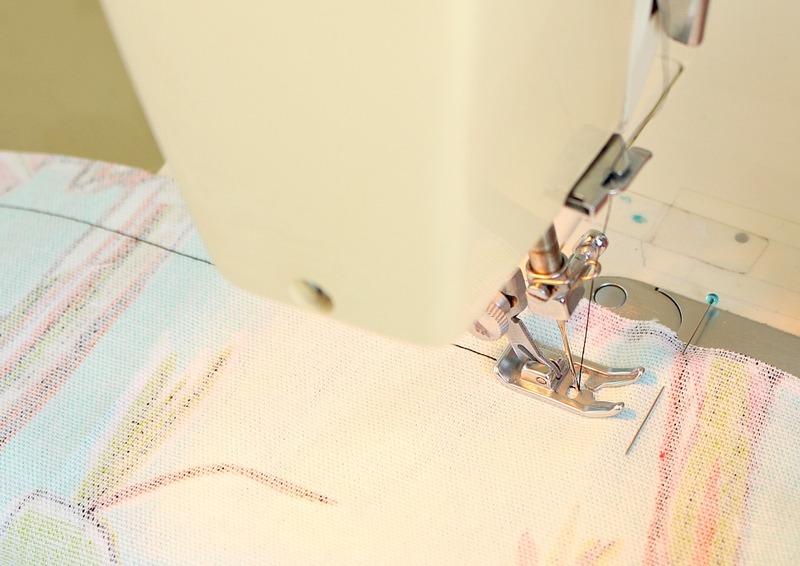 Figure out the preferred finished dimensions of your tote and cut out two rectangular pieces of fabric that size, adding approximately 6/8 of an inch for a seam allowance. We chose a size that maximized the print (neither of us wanted to cut the feet off the little birdies). Using a self-healing olfa mat with an olfa rotary cutter and ruler makes cutting a straight line a breeze. With the two sides of the tote cut out, sew the top of the tote with a large basting stitch (this will be cut open later for the zipper). 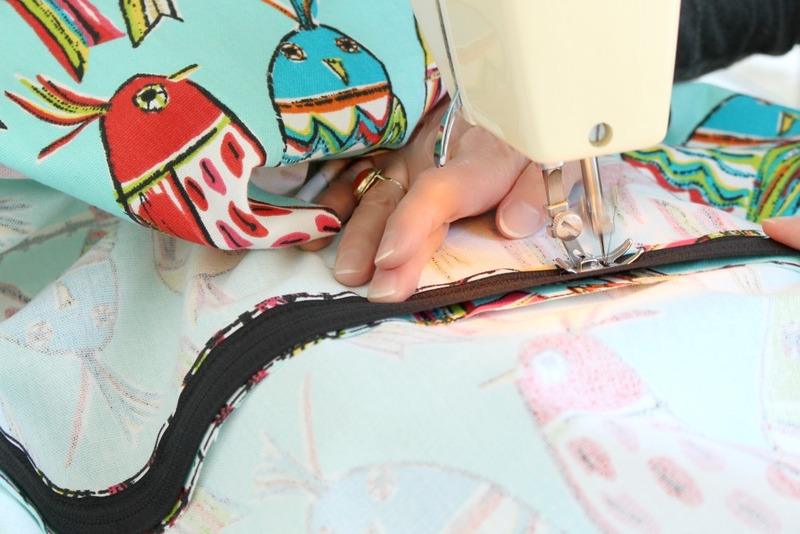 For the space beyond the zipper location, use a regular stitch on the sewing machine to make sure it’s secure. Next, insert the zipper into the top of the tote. 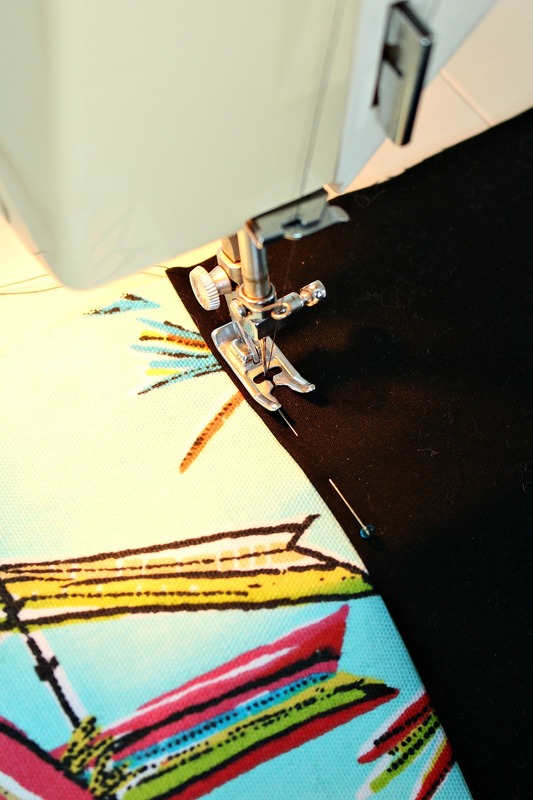 Open up the tote and place the zipper face down on the wrong side of the fabric (where it’s sewn together) and then sew a rectangle around the zipper with your machine’s zipper foot. In these photos you’ll see we started with contrasting black thread but quickly changed our minds and found the perfect aqua in my stash. Luckily we weren’t too far along before changing our minds. 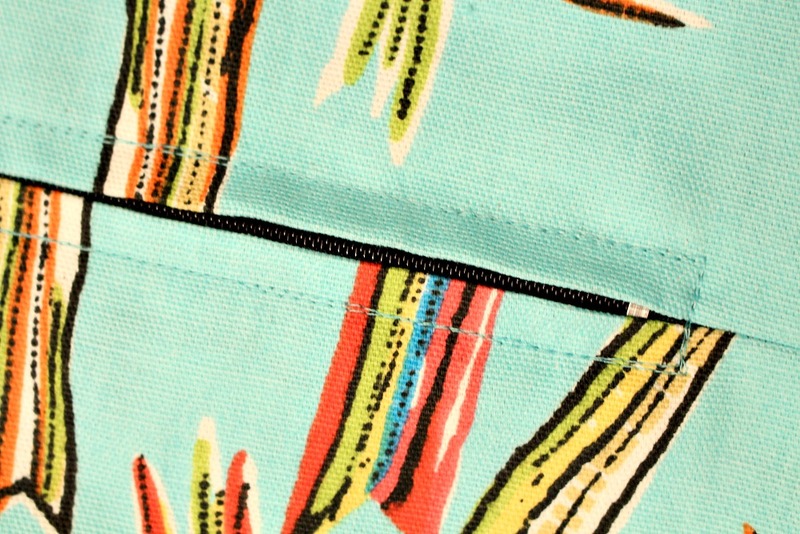 Remember that, at some point, you have to cut open the basting to move the zipper tab so the seam is nice and straight – you don’t want the stitching to follow a weird lump around the zipper tab. 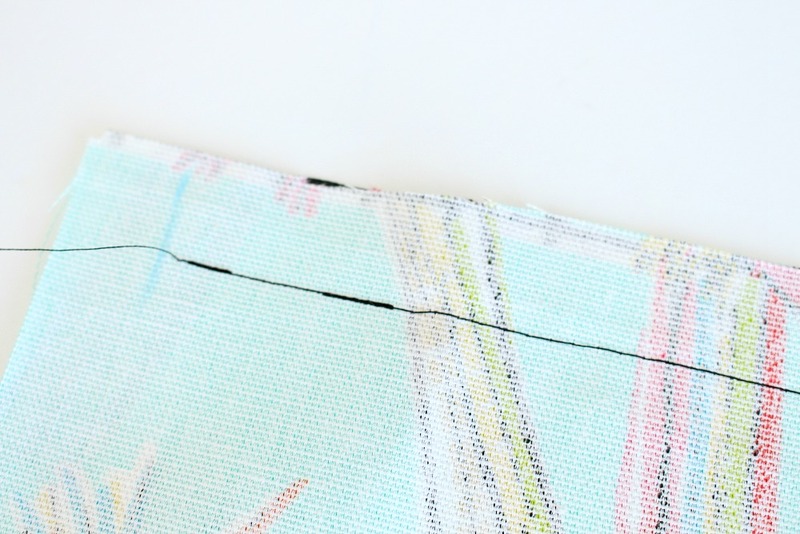 This might sound familiar from our tutorial on how to sew a pillow with a flapped zipper. 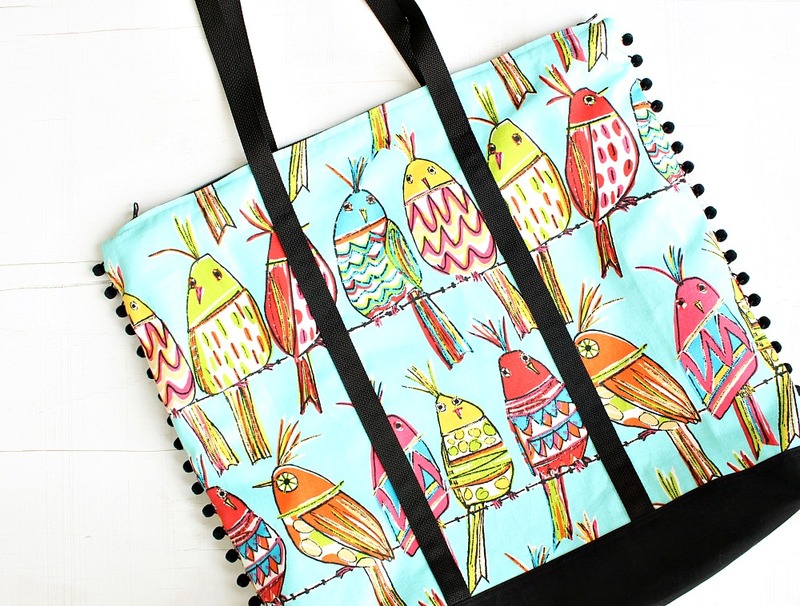 While the tote is still open, sew on the webbing straps. 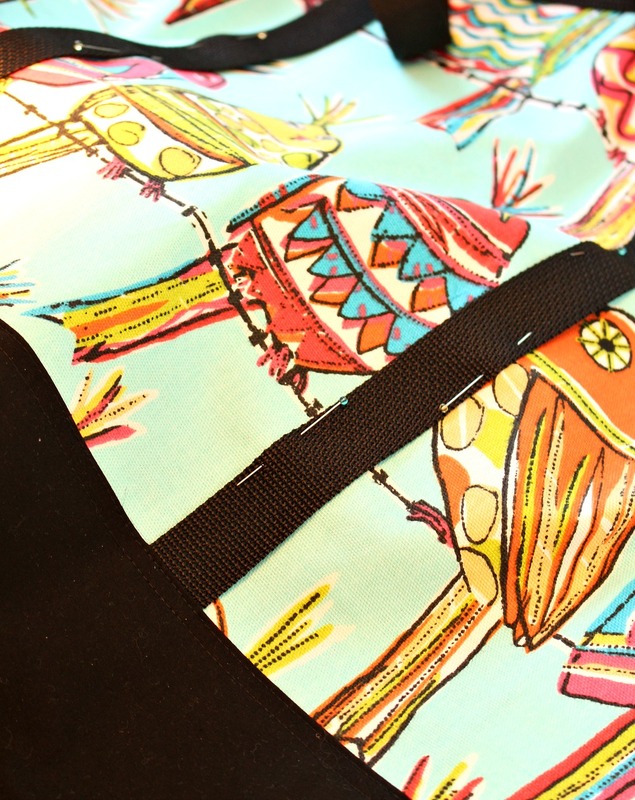 We also sewed on a piece of contrasting fabric for a bottom (to tie together the black straps and pom pom trim with the pattern), which is where the ends of the straps are buried for a neat and tidy finished tote. We used an existing tote to figure out the length of the straps (approximately 25″ from the top of the tote, plus additional length for the sides). Anchor the straps into the bottom of the tote (under the black fabric in this case), first. 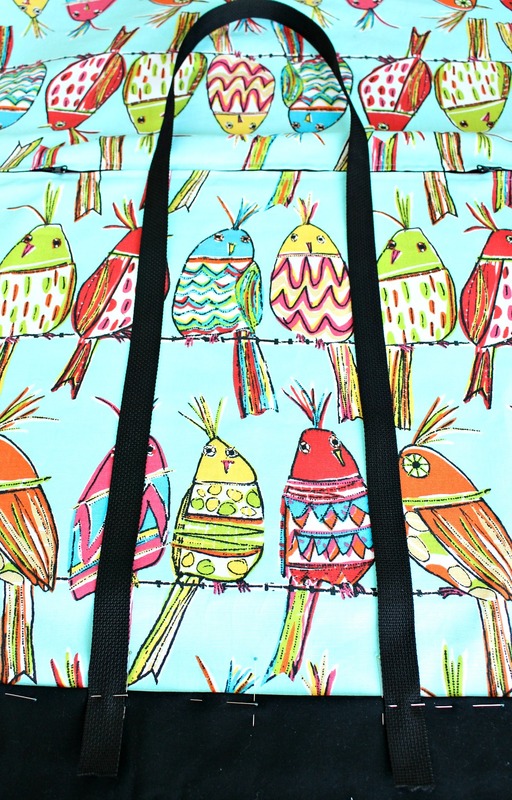 Then sew up along the length of the straps and sew to the front and back of the tote bag. 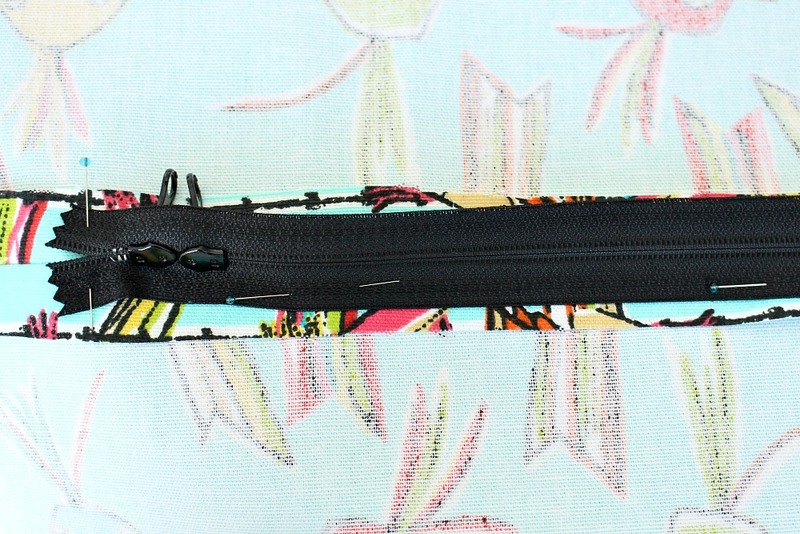 Sew along the edges, up to the top of the tote bag close to the zipper, then back along the edge to the bottom for strength. Cut out two pieces of fabric for the lining, the same size as the tote exterior fabric. Then lay out the tote, right side down (wrong side facing you) and sew together the lining – but only at the edges, where the zipper isn’t. Leave the middle, where the zipper will be, open. Fold the raw edges of the lining underneath (making sure the zipper won’t catch it when being used) and then iron so it lies flat for the next step. 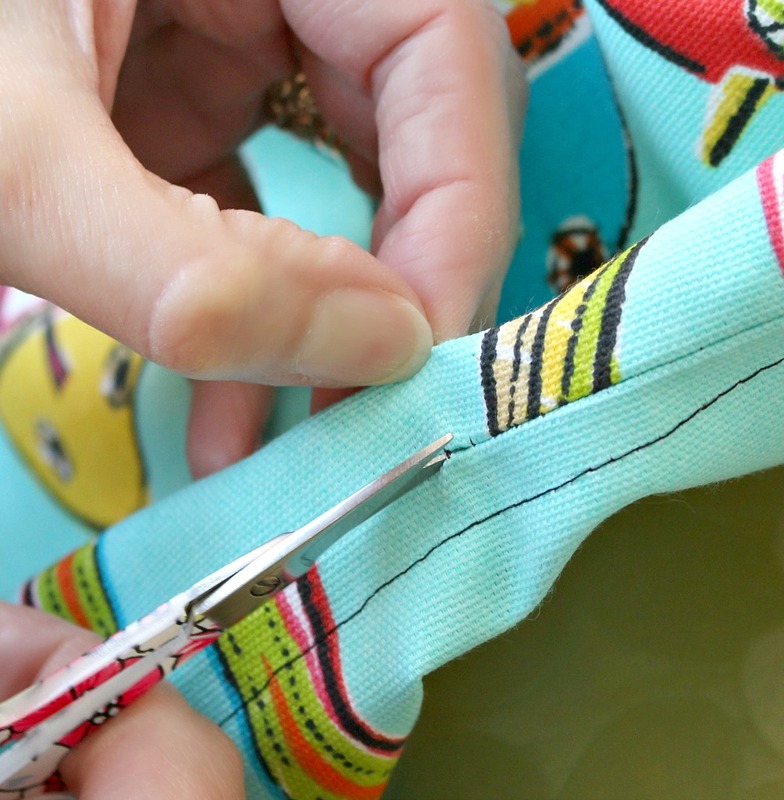 By hand, baste the lining to the wrong side (inside) of your tote fabric, around the zipper. 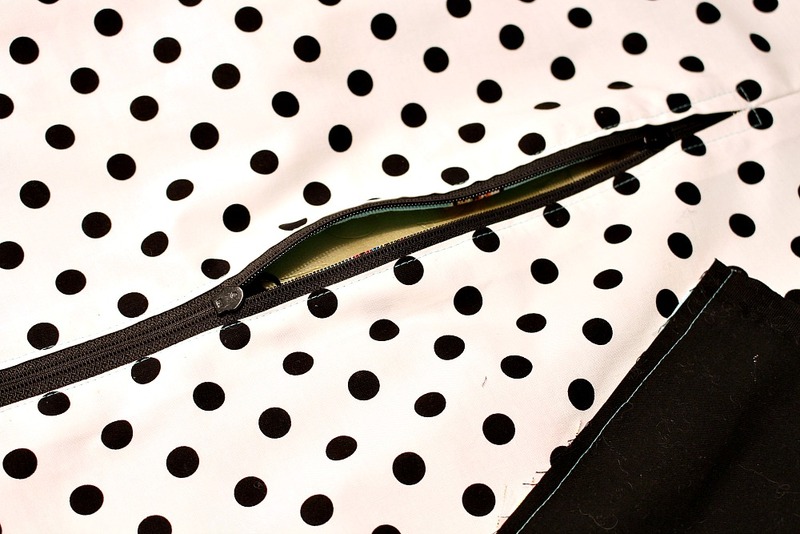 Flip the tote bag over, and, on the right side, go over the same stitching for inserting the zipper to anchor the lining fabric to the tote, without leaving a second set of stitching. So to the eye, it looks like the same row of stitching has affixed the zipper and the lining on the opening of the bag. Open the zipper from this point forward – VERY important step! Pin together the right sides of the exterior tote fabric – inserting the pom pom trim if desired (so the pom poms face inward at this point). Pull the lining fabric in the opposite direction so it’s out of the way for now. 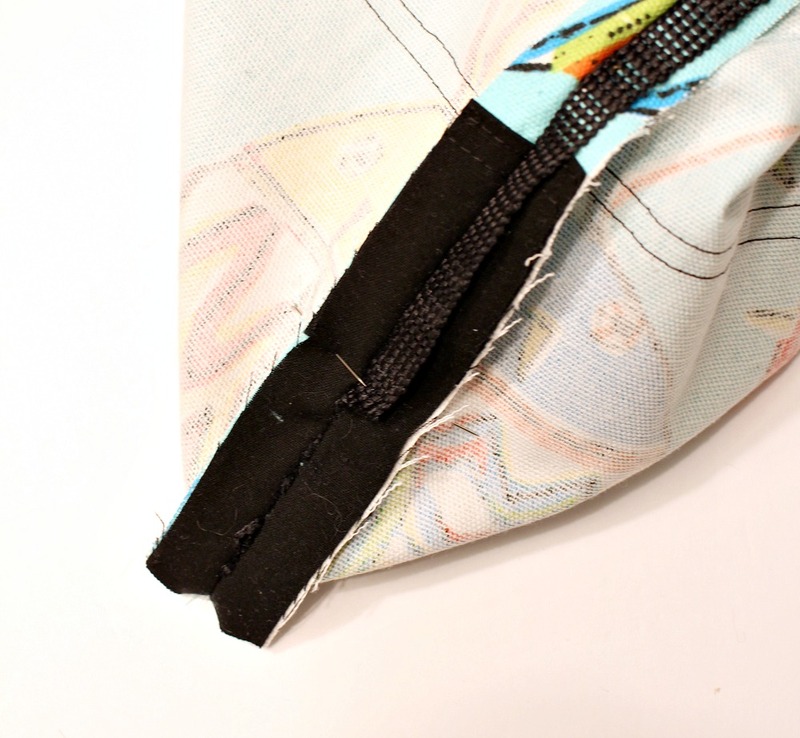 Starting at the top of either side, sew toward the bottom, along the bottom and back up the other side to close the tote, leaving approximately a 6/8″ (3/4″) seam allowance. Trim the seams and then sew the bottom corners to create a nice square tote bottom. Basically, you create a triangle by matching up the bottom and side seam and squishing it flat. 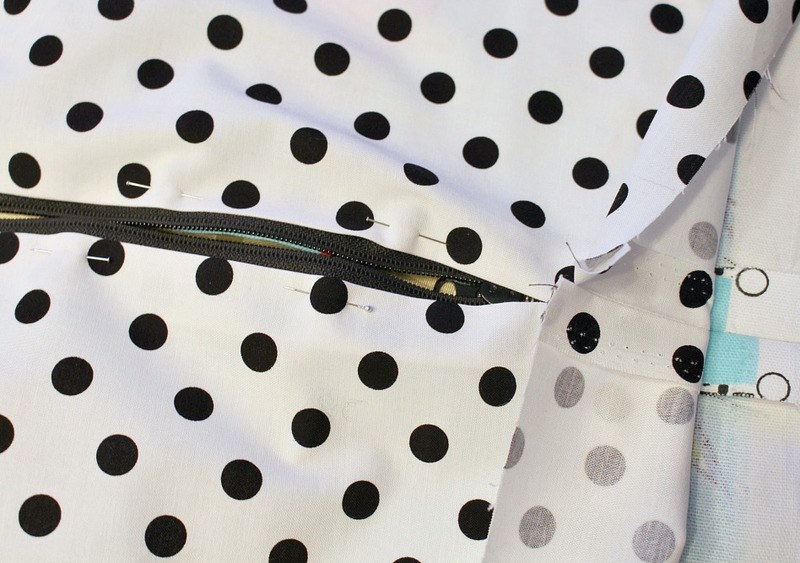 Once the corner is sewn, trim off the excess fabric. This step is optional, but it helps create a nice shape so it’s less of a sack and more of a box. With stiffer fabric, this difference is much more prominent and the tote will sit nicely. Sew the lining now, with the right sides together, but leave most of the bottom open so the tote can be turned right side out. Once the tote is flipped right side out, sew the bottom of the lining and then push it into the tote, lining up the corners so everything is nice and smooth. If the bottom of the tote has a large box bottom, the lining can be sewn into the same box shape, but it’s not necessary for a smaller tote bottom like this one. We also anchored the strap to the lining, which you’ll see in photos. Happy sewing! 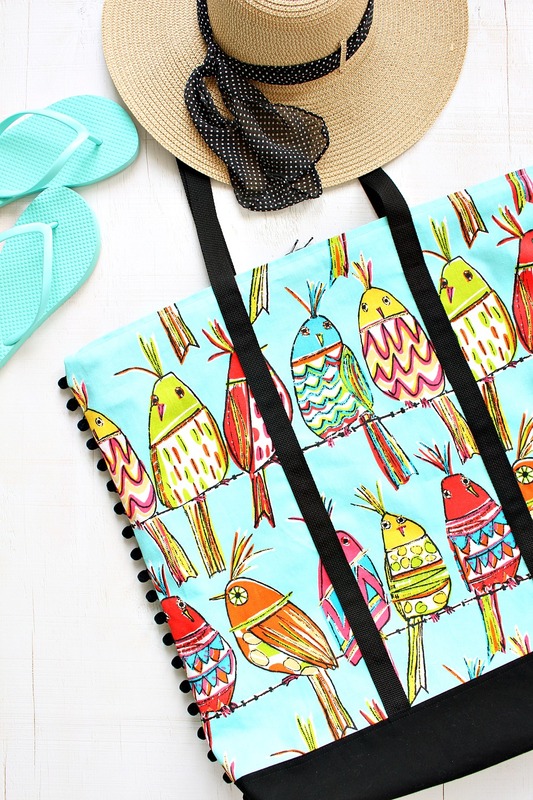 If you make this DIY beach tote with zipper closure, I’d love to see. Next Post Leesa Mattress Review: is a Mattress in a Box Really Comfortable? Amazing! I love this fabric, and the pom-poms are so cute. I made a similar box bottom beach tote a few years ago with black on the base but without the zipper- I only have mediocre sewing skills so while I've had some success with zippers, I've only done a few and I have to follow a how-to each time. 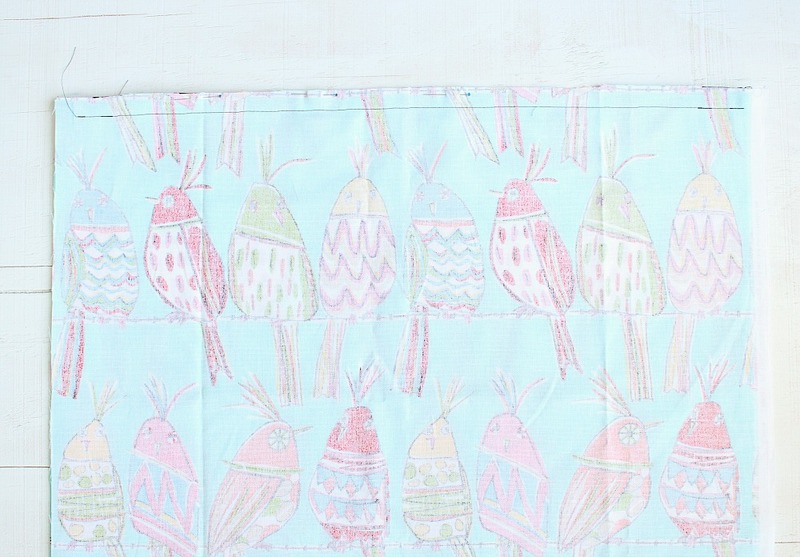 Your mom has some handy skills.I so envy your cute bird fabric- such a perfect pattern for a tropical vacation. Enjoy your beach time! Zippers can be tricky! Awhile back we were seeing soming and forgot to open the zipper until it was too late and we sewed the thing closed and had to rip it open. Isn't that fabric adorable? Fabricland has been really impressing me recently. We bought cute dress fabrics too. So happy you think so! I loved picking out the fabric and trim. Such a fun and satisfying seeing project. This is just adorable! I love the fabrics and the pom-poms. They look perfect. You and your mom are so inspiring! Thank you!! I have been wanting an excuse to use this Pom Pom trim! The tote bag is just too cute. 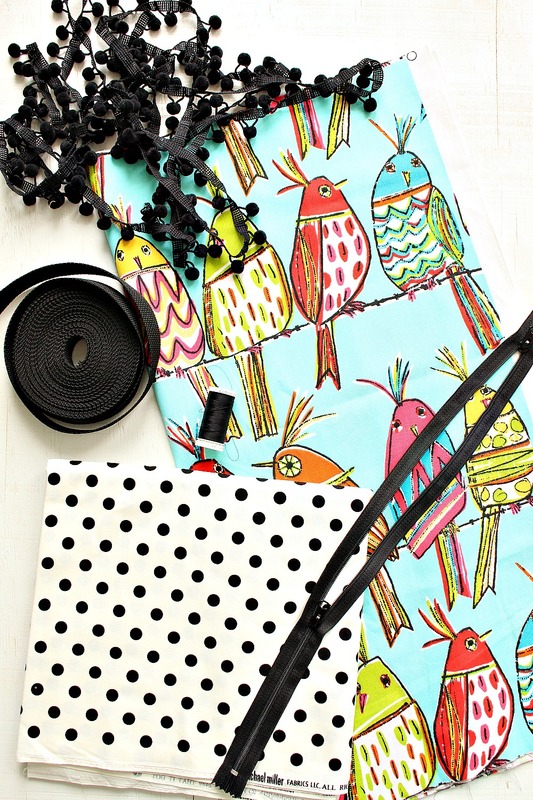 Love the polka dots and birds combo. Thank you!! That fabric was such a happy find! Lovely! Black on the bottom is so smart. I love pom poms. I made some envelope pillow covers of red and white maple leaves (for Canada 150 don't ya know) with pom pom trim, two with white pom poms and two with red pom poms. I hope you have some Canadian themed crafts coming up! I hadn't thought about it!! I'm a terrible Canadian, I'll have to think of some ideas. Thanks for the nudge… 🙂 I love the sound of your pillows, how festive!